This website reports on the findings from a Research in Schools Project (2016) funded by an Independent Schools Queensland (ISQ) school grant, provided by Student First Support Fund (an Australian Government Initiative). Laura has been teaching for 10 years. She has a particular interest in the role of technology in education which has lead to her taking on the role of Primary Campus eLearning Coordinator. She teachers a Year 6 class for half of the week and fulfills her technology role for the remainder of the week. Sheryl has worked as a teacher in Australia and South Africa and has over 20 years experience in the classroom. She is recognised as a Highly Accomplished Teacher at the College, which she was awarded in 2016. Sheryl works actively to continue to develop and improve her practice. She teaches a year 5/6 composite class this year. The Springfield Anglican College is a K-12 coeducational independent school in the Greater Springfield community. The College is split into two campuses; a primary campus (Kindegarten to Year Six) and a Secondary Campus (Years Seven to Twelve). The College vision is to become the leading independent school of choice within the Greater Springfield and surrounding areas with a high level delivery of curriculum and student achievement. Further strategic goals are centred around developing a strong pedagogic practice, delivering differentiated learning, technology integration and collaboration. At the commencement of the project and when identifying potential ideas for the study, the research team identified concerns about diminished motivation and engagement in students in the upper years of primary. The team also identified that leveraging the potential of our newly implemented 1:1 devices may be the key to reenergising students, while improving students outcomes and teacher pedagogy. With these concepts in mind, the research team continued to refine ideas and settled with the following research question. 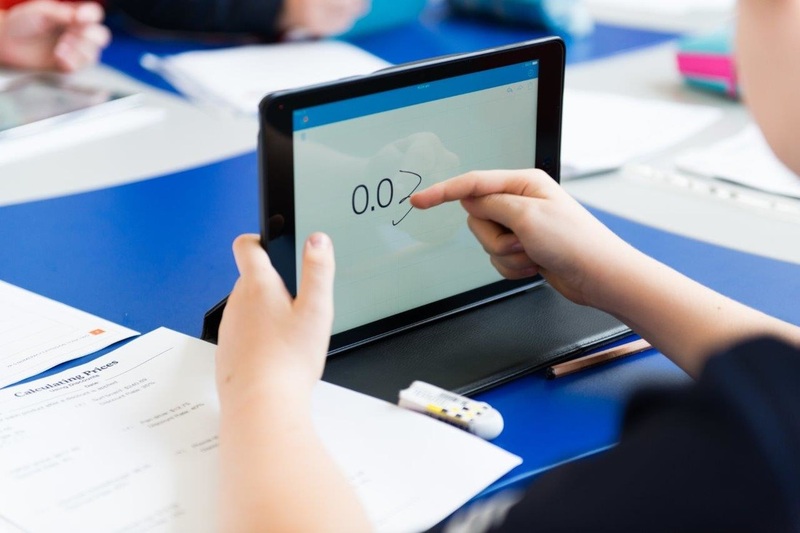 How can 1:1 devices be utilised in transformative and authentic ways to improve collaboration, engagement and outcomes for teachers and learners? Prior to the commencement of the project, academic literature and educational publications introduced several areas, when combined with the 1:1 technology in our classrooms, could have the potential to impact upon our students. The first of which was the way the children worked on their devices within the physical classroom environment. The delivery of content and the way children were access their lessons didn't require them to adhere to a physical classroom placement. The notion of needing a set ''desk'' where they kept their books was scrutinised, as the need for many books had been greatly diminished by the introduction of 1:1 devices. Initial investigations into working with technology in a 21st century way introduced the concept of "Flexible Classroom Environments". A study at Albemarle County Public Schools in the USA, which was published on the Edutopia website claimed that flexible classrooms empowered student choice, increased student engagement, and improved student participation. The study suggested that a more flexible learning environment also fostered greater collaboration between students. Collaboration itself was a strategic priority of the College for 2015. This was underpinned by the idea that collaboration itself was an integral skill for 21st century learners to develop.